If you want to verify a driving license any drivers license issuing authority of Pakistan, follow the instructions given below. How to Verify Driving Licenses issued by DLA, NHMP? If you want to verify a driving license issued by Drivers Licensing Authority (National Highways and Motorways Police), click Here. How to Verify KPK Driving License? 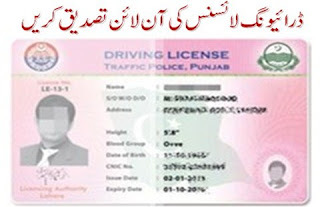 Click Here and enter your CNIC number to verify driving license issued by KPK Police. Send SMS ""CDL CNIC-No" to 8583. How to Verify Punjab Driving License? Visit DLIMS website and enter your CNIC number without dashes to verify the driving license. How to Verify Balochistan Driving License? You can also verify a Balochistan issued driving license on Quetta Traffic Police website by clicking Here. You can either enter license number or CNIC number to verify. How to Verify Sindh Driving License? Although we could not find any online system for verification of Sindh driving licenses but you can do so by installing this Android app on your smartphone. NH&MP ka licence banny k kitny din bad online show hota hai,.